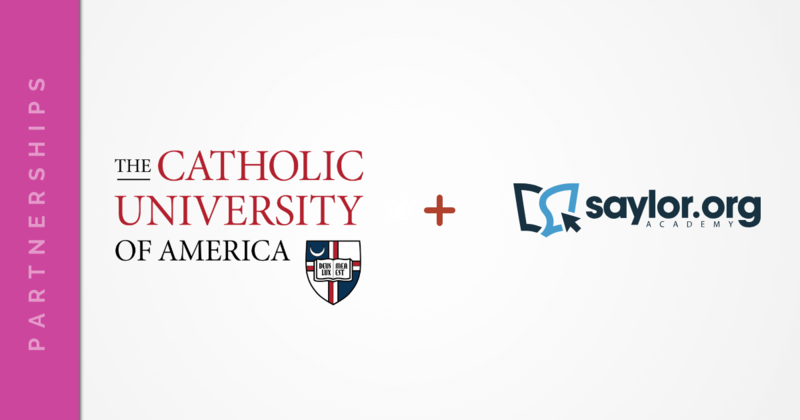 Saylor Academy is very pleased to announce a new partnership with The Catholic University of America- Metropolitan School of Professional Studies (MSPS), to provide expanded college degree completion opportunities for MSPS students. Students will now be able to transfer Saylor Academy’s tuition-free college-credit courses into the Metropolitan School, which focuses on adult learners. This college program for adults serves a growing demographic in higher education. The Catholic University of America-Metropolitan School of Professional Studies and Saylor Academy both recognize that working learners such as MSPS students require flexible education options to balance skill development with work and family demands. Saylor Academy’s always-available, self-paced course model specifically supports working adult learners as they progress toward completing their degrees. The tuition-free aspect of Saylor’s program allows students to start, or return to, their degree completion journey with zero financial risk. “All of us at the Metropolitan School of Professional Studies welcome this partnership, because it will enable our undergraduate students – working adults from throughout the Washington area – to complete their bachelor’s degrees more quickly and at lower cost,” said Dr. Vincent Kiernan, Dean of the Metropolitan School of Professional Studies. The Catholic University of America- Metropolitan School of Professional Studies (MSPS) is dedicated to helping non-traditional, adult learners achieve their academic and professional goals within a framework of ethical leadership and service to their community. MSPS is diverse, and the school includes students, faculty, and staff from the greater Washington D.C. area and around the world who represent many ethnic, religious, and socio-economic backgrounds. MSPS offers a wide range of degree programs, from Certificate, Associate’s, Bachelor’s and Master’s levels, developed especially for adult students. About Saylor Academy: Saylor Academy is a 501(c)(3) nonprofit initiative working since 2008 to connect students to free and affordable education toward better skills and higher education. Saylor Academy’s tuition-free college credit program partners with colleges to help students into, through, or to return to a degree program. Saylor Academy’s courses have been reviewed by the American Council on Education (ACE). These courses are recommended for credit by ACE, due to the academic rigor and quality assurance measures used by credentialed experts to build them. For more information regarding Saylor Academy’s offerings or workforce degree completion programs, please contact Jeff Davidson, Executive Director at [email protected] or Jacqueline Arnold, Manager of Strategic Communications and Relationships, at [email protected].